Community-owned solar mini-grids (SMGs) are increasingly promoted to provide communities access to reliable electricity, empowering local actors as they become active stakeholders in projects. However, early failures and difficulties in building local capacity have raised questions regarding their long-term sustainability and ability to be replicated to provide socio-economic benefits to the communities. This study assesses the sustainability of 24 community-owned SMGs in India operating over extensive periods of time using a novel scoring framework using mixed methods to derive its conclusions. The study found that institutional, financial, and technical capacities, central for the SMG’s long-term sustainability, could be achieved through community engagement from early stages, if communities are allowed freedom to develop governance procedures while at the same time clarifying roles and responsibilities. This creates strong sense of ownership that is key for effective and inclusive governance. User satisfaction, ensured through provision of usable supply in line with users’ expectations, motivates actors to make regular payments, thus leading to economic sustenance. While social and environmental benefits were observed, energy consumption and engagement in productive activities remained marginal. The study reports an example of community-owned SMG model that has been replicated sustainably over many cases, overcoming key challenges related to appropriate financial and technical management and producing positive social impact. Low engagement in productive activities was more a factor of the local socio-cultural contexts, rather than limited paying capacities of the users. To increase energy utilization and create environments for sustainable rural living, the study recommends implementation of systems that link energy with other rural development needs such as agriculture or water provision. The study also recommends more use of qualitative and quantitative data for impact analysis to ensure that conclusions are generalizable and provide rich contextual explanations for the observed phenomena. Although India declared 100% village electrification in April 2018, more than 26 million households still lack access to electricity.1 Despite extension of the central grid continues to be the favorite vector to deliver electricity in the country, recent studies  highlight that poor reliability of supply is causing 34% of “electrified”2 households to rely on kerosene as their primary source of illumination. As an alternative solution, off-grid systems powered by renewable sources available locally such as solar or wind energies are being promoted, both by private actors  and the national government , through the implementation of mini and micro-grids in remote inaccessible villages to help India reach its electrification target. Among the different ownership models, community-owned solutions, where the financial and technical responsibility for ongoing operations resides with the beneficiary communities, are gaining significance [4–9], with many studies highlighting how upfront community involvement during system’s design and installation empowers local actors as they become active stakeholders in the project . This facilitates the system’s long-term functionality, as it creates stronger sense of local ownership , and increases user satisfaction . For example, the state of Chhattisgarh successfully installed more than 1400 solar mini-grids (SMGs), involving local communities during needs assessment while leaving the responsibilities for daily technical and financial management with the implementing agencies . This resulted in greater acceptance from the communities while at the same time it ensured prompt issue resolution, owing to clarity of roles among stakeholders. On the contrary, community engagement for SMGs in the Sundarbans Islands in West Bengal was less systematic, and the role of communities and their interactions with other stakeholders was not clearly defined , ultimately affecting the system’s functionality. Other examples include the failure of the Village Energy Security Program, a government-led biomass and biofuel-based mini-grid initiative, aiming to involve communities in the entire process of production and supply of electricity. In this case, limited local capacity and technical knowledge summed to unclear definition of roles and responsibilities among stakeholders, causing inefficiencies and plants shutdowns . Studies of the economics and institutional barriers for community-owned systems also highlight how economic viability is contingent on local leadership  and appropriate institutional design , while others  warn that local level conflicts and elite captures may subvert the effective process of local participation and equity. With increasing emphasis on community participation in energy projects, there is a need to understand the conditions for effective community involvement and how responsibilities among stakeholders can be distributed in order to ensure their long-term operation [12, 13]. To date, data showcasing performances of a wide range of community-owned SMGs operating over a long period of time is lacking. Studies available are either limited to individual projects [18, 19], to a small selection of case studies , or rely on large surveys collecting quantitative information at a household level . Ex-post evaluation of a large array of mini-grids operating over extensive periods of time could provide key information on the factors affecting the models’ effective ownership structure, with significant implications for practitioners and policy-makers as they design long-lasting sustainable solutions. It is against this backdrop that this paper attempts to answer the following question: under which conditions can community-owned SMG systems3 be sustained and replicated so as to provide socio-economic and environmental benefits for the communities? Among the many types of community-ownership models, this paper focuses on SMG systems where community members, who are also the beneficiaries, are responsible for the plant’s ongoing technical and financial management. Community members are also responsible for ensuring user satisfaction with day-to-day operational decisions, whereas ownership over assets is retained by other stakeholders. This model provides a good arrangement for decentralization of energy production and distribution and therefore is prioritized for the study. 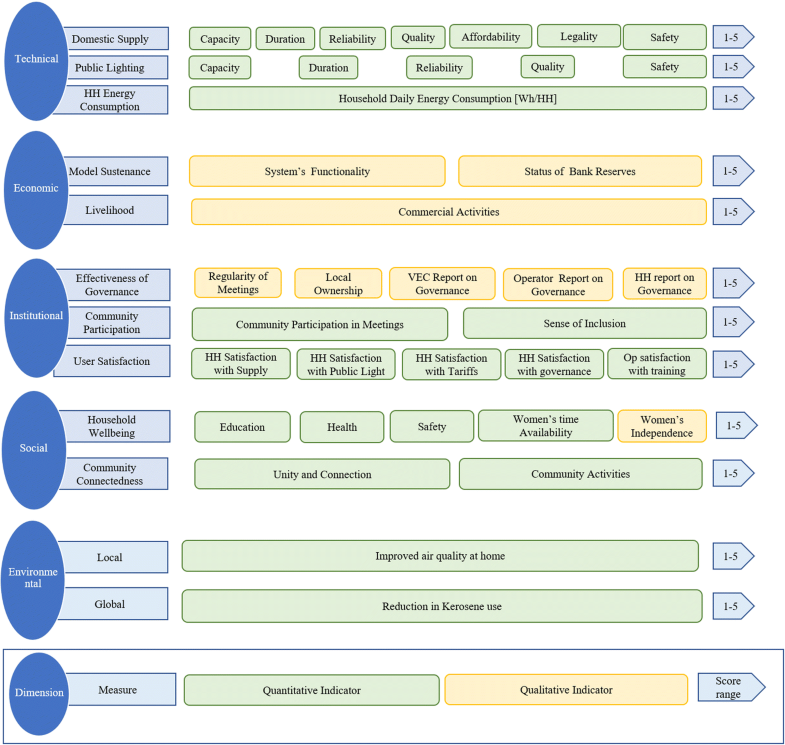 To answer the research question, this study uses a novel framework  where the systems’ functionality is analyzed across several sustainability dimensions using mixed methods. The research selected SMG installations by Gram Oorja (GO), a social enterprise operating in India. The companies’ portfolio counted of over 24 SMGs in three different states operating from few months to over 5 years, thus offering a sufficiently varied sample for the study. Plants provide continuous supply for domestic users, household-level commercial activities, public spaces and, in some cases, water for drinking purposes. Installations are community-owned, with a locally elected Village Energy Committee (VEC) owning responsibility for daily technical and financial operations. The ownership of assets is retained by the funder with the ability to withdraw the assets if the plant becomes non-operational for reasons that are attributable to the community. The financial model is hybrid where capital costs are provided upfront, whereas recurring Operations and Maintenance (O&M) costs are addressed through billing from metered household consumption. Payments are collected by a local plant operator (PO) and deposited in a bank account that is managed by VEC members. This analysis uses the framework and scoring methodology proposed by Katre, Tozzi  to assess performances of SMGs individually, according to the specific model implemented. The framework looks at five dimensions (technical, economic, institutional, social, and environmental), each described by a set of measures selected to reflect sustainability characteristics for the model considered. Each measure is composed of a number of indicators (either quantitative or qualitative) and is assigned a score from 1 (lowest) to 5 (highest) reflecting the performance of the installation analyzed under the measure considered. The procedure to arrive to a measure-level score is described in detail in the “Data Analysis” section. For GO’s community-owned model, each installation is described through 12 measure-level scores across the 5 dimensions, as depicted in Fig. 1, where color-coding highlights whether indicators are composed of quantitative (green) or qualitative (yellow) data. Household (HH) energy consumption: looks at individual household energy consumption expressed in daily watt-hour per household as per meter reading. Livelihood generation: looks at the ability of the SMG to stimulate productive use of energy and spur economic growth. This is assessed by looking at the number and types of business activities in each village that use SMG electricity. User satisfaction: investigates satisfaction of local users across five indicators, household’s satisfaction with the supply, with public lighting, with tariffs, that of households with governance procedures, and that of the operator with the training received. Community connectedness: defined by two indicators, namely, increased connection among community members and with the external world, and community-led activities linked to electricity. Global scale: reduction in carbon emission from decrease use of kerosene for lighting. The research assessed 24 of the 26 SMGs operative at time of the study, leaving out 2 sites due to logistical reasons. Mixed data were collected from a range of sources, using semi-structured discussions with VEC members, surveys with households and local operators, and recording data from energy meters and bank passbooks. The use of an interview protocol (see Appendix) to guide the semi-structured discussions with VEC members and framing context-specific open-ended questions in the household surveys ensured that the data gathered were relevant, meaningful, and reliable. In each village, approximately 20% of the households were interviewed following a stratified sampling procedure to ensure good representation of the population in the analysis. Sampling focused mainly on capturing differing levels of wealth, engagement in livelihood activities, female-, and male-headed households, including households located at the center and the periphery of the village. All data were collected in person by independent trained staff, with no affiliation with GO nor with any of their partnering organizations. Interviews were held in the local language facilitating freedom of expression and reducing chances of socially desirable responses. To begin with, for each installation, quantitative data were mapped to their respective indicator. For example, information around bank balance, frequency of bank transaction, date of last transaction, was mapped to “Status of Bank Reserves” indicator under the model sustenance measure. In every village, percentages of responses for each question in the household surveys were computed to arrive at indicator scores. For example, percentage of participants who responded being “satisfied” to the question about their satisfaction with the energy system was aggregated to arrive at a village-level score for “HH Satisfaction with the Supply” indicator. For qualitative data, each researcher independently listened to the VEC interviews several times, read the transcripts, and coded them to highlight significant passages. Attention was paid to trace relevant information which was mapped and marked to specific indicator(s). For example, the narratives, “we skip bank deposits during monsoon months” or “the monthly collection is deposited by the operator with [the VEC]…because the bank is quite far, the money is deposited when somebody travels to [the place where the bank is located]” were coded as important for the “Status of Bank Reserves” indicator. For each measure and its indicators, quantitative data were combined with relevant qualitative data from various sources, compared against benchmarks to arrive at scores. Tables 1, 2, 3, 4, 5, 6, 7, 8, 9, 10, 11, and 12 (adapted from Tables 3, 4, 5, 6, 7, 8, 9, 10, 11, and 12 from Katre, Tozzi ) report benchmarks for each indicator and how these are aggregated to measures. For example, if the inspection of bank passbook revealed that only half of the expected reserves had been deposited against the battery replacement target, but qualitative data provided a reasonable explanation of the infrequent deposits (like in the example above), then the score was mediated to account for both information. Each time, measure score was determined by the lowest scoring indicator to highlight bottlenecks and areas for improvement of performance, using the same approach suggested by the MTF. When scores spanned across multiple benchmarks, the highest score was applied. Each researcher followed this procedure independently to arrive at individual scores for indicators and measures. These were then compared, deliberated upon as a group, rationale for assigning scores discussed, and differences, if any, resolved to arrive at a final score for each measure. The approach followed, involving specific indicator benchmarks, rigorous coding procedures, independent scoring by each researcher, group discussion and deliberation, minimized subjective bias in the process, and ensured the validity of the resulting analysis. Notable quotes that provide thick description of some of the final measure scores are provided in Table 13. No early failures, no issues with brightness, flickering, etc. Payment discontinued due to technical issues or internal disputes. Despite ongoing payments, issues are reported by users around timely collections, payment delays, and deposits. Users report sound financial management, timely collection, and limited-to-no payment delays. Less than 20% of expected reserves is collected or data not available. Passbook shows no entry in last several months. Between 20% and 40% of expected reserves are collected. Passbook shows no entry in recent months. No other explanation from qualitative data for missed payments. About half of tariffs collected compared to expected reserves. Passbook shows dispersed payments. Qualitative data from discussion with stakeholders provide an explanation for recent missed payments. About 60–70% of expected tariffs are collected. Passbook shows regular payments over extensive periods of time. About 80% or more of expected tariffs are deposited in the account. Regular entries in bank account. No economic activities linked to energy use. Users are not reporting increase in productivity linked to electricity. Limited livelihood activities; those available are linked to lighting provided for small household-scale commercial activities. No increase in productivity registered in other areas. Use of electricity for some livelihood activity is observed, and some users are purchasing equipment primarily for agricultural purposes. Few users engaging in new businesses activities. These are linked to processing of agricultural products such as rice huller or flour mills. Engagement in livelihood activities is extended to several households. There are many examples where users actively engage in new business activities, purchasing electrical equipment beyond those used to process agricultural products. Institutional meetings for energy-related issues are infrequent and ineffective. Meetings are happening, though not very frequently. High disagreement among household on date of last VEC meeting. Frequent meetings and stakeholders recollect with fair precision the date of the previous meeting. External interventions from higher organizational level are largely needed to initiate meetings and discuss issues. Local actors demonstrate autonomy in governance procedures; however, external intervention may still be needed to take care of technical issues or to solve internal disputes. Local actors have been able to autonomously craft and modify rules around the use and management of the system to accommodate local necessities, timely seeking help in cases when external support was needed. VEC is very ineffective, and members are not identifiable. VEC members are identifiable; however, there is no clear structure defining member’s roles and responsibilities. If in place, procedures are highly informal. There is inconsistency when VEC articulate rules in place. Members are identifiable, able to describe procedures, rules, and how these are enforced. VEC members may still seek local actors to solve internal issues and disputes. There may be cases in which VEC members have left and have not been replaced. Members are identifiable, able to describe procedures, rules, and how these are enforced. VEC report how issues are attended to in a timely manner with limited to no system downtime due to institutional inefficiency. If identifiable, operator has repeatedly been unable to take care of minor technical issues with domestic connections, like assisting with replacement of light bulbs or small issue with connections at home. He/she is also unable to maintain clean panels/control room. Operator has been able to solve most of issues with domestic connections but seeks external help for any matter concerning equipment in control room or street light. Panels and control room are well kept. Operator has been able to take care most of the issues arising with domestic connections. Panels and control room are well kept. He/she demonstrated ability to identify issues in control room, performed based troubleshooting, fix those in his/her competency, and actively seek support from GO when more expert support was needed. HHs report institutional and technical issues, most of which were solved on time, some issues took longer to fix or were outstanding. HHs report few institutional and technical issues, all of which have however been solved by those appointed in a timely manner. Less than 30% of HHs surveyed report participation in meetings. This is also backed by remarks on non-usefulness of meetings. About half of HHs surveyed attend meetings and have general feeling of these being useful. Over 70% of HHs surveyed attend meetings regularly and mention raising issues for discussion. Less than 30% of HHs surveyed report a feeling of ownership of the installation and do not feel included in key decisions. Women in particular and representatives from households that appear marginalized are particularly disengaged. About half of HHs surveyed report a feeling of ownership and inclusion in key decisions. Engagement is low for women and marginalized households. More than 70% of HHs surveyed report a feeling of ownership and inclusion in key decisions, including women and marginalized households. About half of HHs surveyed report improvements in terms of better eyesight, reduced respiratory problems and body pain. More than 70% of HHs surveyed report improvements in terms of better eyesight, reduced respiratory problems and body pain. Women are not able to conclusively communicate an increased sense of independence in the home or within the communities. Women highlight some degree of increased autonomy, particularly in the home. Women provide rich description of examples where they took decisions autonomously or are more independent in areas previously not allowed to them. Examples include purchase of equipment, ability to move freely in the village or visit the market, visit friends, and participate in meetings. Q9: “The foundation on which the meter is mounted has broken. So we discussed that we should use the money from our bank reserves to fix this problem. Everybody in the meeting agreed. After assigning scores for each installation, they were analyzed using central tendencies, visual time graphs, pie charts, and histograms to examine trends and highlight performance variations across sites. Before starting data collection, GO was also asked to provide internal targets for technical indicators. This information was used to understand whether any discrepancy between expectations set with the community during participatory planning and service delivered had caused discontent, institutional, or financial inefficiencies. Visualization of scores was backed with thick descriptions from qualitative data and, when needed, looking back at individual scores corresponding to the underlying indicators. This allowed to better understand the patterns exhibited and capture emerging trends across groups of measures. From this analysis, a narrative emerged across the whole set of sites that lead to conclusions for sustainability conditions and replicability of the community-owned model analyzed. In this section, we show results from scores across all measures supported by the quotes presented in Table 13 (referred as Q followed by relative number as coded in the table). Scores for all three technical measures are reported in Fig. 2, and mode values for indicators in Table 14. Granular scores for reliability and quality for domestic supply are also reported in Figs. 3 and 4 respectively, due to the large variation these indicators displayed across sites. In the time graphs, each geographic cluster is represented by a different color4; the size of the circles represents the number of households connected to the grid in each village and, where shown, the dotted line represents GO’s internal target. Starting with domestic supply, indicator scores matched GO’s targets, highlighting consistency of performance, particularly with respect to quality and durable supply throughout the day. The 54% percent of sites with a score of 2 were found to be limited by the installed capacity which, in most cases, sat at the higher end of the benchmark (an average of 220 Wp per household). Sites that demonstrated poor reliability (Fig. 3) and quality (Fig. 4) were due to severe weather conditions resulting in failure of components, a one-time event in the green cluster, and limited battery capacity during summer nights, particularly relevant in the yellow cluster that saw a surge in fan utilization at night. Public lighting scores, on the other hand, showed large variations and relatively poor performance, with only 13% of the sites meeting the internal target (Fig. 2). Issues were due to poor quality, including malfunctioning or non-operative poles, and limited capacity leading to large unlit areas in villages. Energy consumption remained largely low and below expectations (Fig. 2), with 73% of the villages scoring 1. Meter readings showed that the average daily energy utilization was 37%5 across all sites, with some sites utilizing as low as 9% of the maximum available energy. Despite GO’s expectation of a growing trend with time, represented as dotted line in Fig. 5, the oldest site only reached 48% of its targeted value. The same image shows how the average daily consumption varied significantly across sites, showing some signs of leveling within a geographical cluster and for installation of comparable size. Moving onto economic measures, livelihood generation (Fig. 6) revealed low-to-modest engagement in commercial activities, across time. The participants’ narratives indicated the need for handholding and support to venture in commercial activities (Q1). Individual entrepreneurship also seemed to be hindered by VEC members themselves due to perception of limited energy availability (Q2), which was often linked to fear that adding productive loads could have harmed the system, depriving the community from basic electricity for lighting (Q3). On the other hand, model sustenance (Fig. 7) suggests that most villages set tariffs in line with battery replacement target and were able to maintain rigor in billing, collections, and financial operations (score 3 or above). Interestingly, some cases scoring 1 or 2, indicated awareness of the need to raise funds internally to cover the deficits when the battery would be up for replacement (Q4), and some VECs were considering of establishing a late fee and a household disconnection mechanism for prolonged missed payments (Q5). An analysis of the effectiveness of governance (Fig. 8) shows that most villages had well-defined structures, locally customized processes and rules, and were able to handle operational issues autonomously with limited external intervention (score 3 or above). This was attributed to the role of GO and local NGOs, which closely assisted the communities in the process of building internal capacity while at the same time pushing back responsibilities to let the VEC gain authority in front of the community (Q6). Generally, procedures for enforcement of rules and money collection were found to vary, as illustrated by Q7 where a committee member explained a unique mechanism for money collection established in the village. This decision, arrived at after experimenting with other mechanisms, also indicates that establishing governance strategies that reflect the local needs takes time. In villages with well-functioning Self-Help Groups (SHGs),6 women’s organizational skills were leveraged for a more rigorous and structured approach, often resulting in highly effective systems, see for example Q8 collected from a women VEC head. Villages that scored 2 were found to be culturally heterogeneous, with sub-groups representing different castes or having contrasting views. Their governance committees struggled to generate consensus, address situations in a timely manner, and enforce rules, occasionally causing the plant to shut down until external intervention facilitated a resolution. Often the small size of villages, where only a couple of voices dominated the local affairs, aggravated these situations, as formal procedures for authority and accountability were highly informal and harder to establish. Community participation reveals high involvement from the communities and a pattern where participation increases with time (Fig. 9). Qualitative data showed that decisions were taken by the VEC in consultation with the community following a common pattern showed in Q9. Women involvement in meetings was found to be generally low (Q10) and to be highly dependent upon facilitation by the local NGO. Interestingly, sites with very low (score 1) or very high (score 5) effectiveness of governance displayed a similar trend for community participation, suggesting a possible relation between the two measures. With regards to user satisfaction, results highlight high satisfaction reported by stakeholders (Fig. 10). Despite some dissatisfaction was reported with respect to street lights (Q11), this generally did not result in significant reduction in the overall feeling of the users toward the solution. Analysis of measures pertaining to social and environmental dimension is presented in Fig. 11. Time graphs are not provided since this score did not vary across time nor location. High scores for household well-being indicate that children generally experienced increased hours for study in the evening, household members, particularly women, experienced reduced drudgery, improved health, and a feeling of safety at night (Q12). When asked about the use of extra time, most women reported being able to manage their work more flexibly, take care of their children, or work more in the farm. Signs of increased independence for women were generally poor, except for sites where women were involved in the governance, thus suggesting a positive effect of women inclusion in the supply of energy. With regards to community connectedness, a feeling of unity was attributed to community participation in planning stages and in the governance, whereas the availability of mobile phones and TVs enhanced the sense of connection with the outside world. Villages performed poorly when it came to channeling internal unity toward new community initiatives. With respects to environmental measures, most of the houses registered a reduction of 75% of kerosene use. However, improvements in indoor air quality were found to be limited due to continued use of firewood for cooking (Q13). This analysis focuses on the conditions for long-term sustainability of community-owned SMGs and their ability to be replicated so as to provide socio-economic and environmental benefits to the local communities. This section discusses two elements based on key themes emerging from the findings: first, it describes the core features that underpin successful community ownership; and second, it highlights the replicability of the model and its impact, emphasizing some of the untapped potential to achieve higher socio-economic and environmental benefits. A central role for enduring community-owned systems is strong local capacity in the areas of governance, financial, and technical management of the installation . While strong local governance and financial capacities determine the ability to define and enforce mechanisms for payment collection, deposits, and penalties [18–22], local technical capacity ensures quick resolution of issues and a continuous supply . Contrary to the often mentioned “limited paying capacity” of the users leading to missed payments and affecting the system’s economic viability [25–27], this study reported several cases of systems that managed to be financially self-sustaining over many years, offering an opportunity for meaningful learnings. The study suggests two strategies to achieve technical, financial, and institutional sustainability. First, allowing communities the freedom to define governance procedures and manage finances allows local actors to come up with solutions that are appropriate to the local contexts. To make sure that such autonomy is not misused, clarity should be provided upfront around responsibilities and to place accountability in the hands of local actors. This means that, together with educating communities about the energy source and its use, assistance provided early on when governance procedures are established, and communities familiarize with financial management and technical instruments is equally crucial. This process usually takes time [11, 28, 29], as is suggested by the increasing trend observed for the institutional measures of effectiveness of governance and participation. Second, as suggested by Mishra et al. , effective local governance goes hand-in-hand with high community participation and involvement. This starts from initial engagement to understand local aspirations for growth , involving communities in capacity planning, setting tariffs, and construction. The ability for anybody to raise issues, discuss them collaboratively, and adapt the rules to local needs [31–33] is critical to instill a sense of ownership in the community. Prior research suggests the importance of socio-cultural contexts for successful rural energy interventions . This research adds to this dialog, as it found that institutional and economic measures in particular were influenced by cultural homogeneity, community size, and women participation, with the latter having a crucial role in creating more inclusive and effective interventions . Finally, the research also confirms the importance of evaluating energy access beyond connections. Like in other cases , duration, reliability, and quality of power to domestic users were crucial to drive user satisfaction, particularly as the technical performance of the systems matched the expectations set upfront by the supplier. Analyzing the off-grid access systems for South Asia projects, Bhattacharyya et al. highlight that most community-based energy access projects are not able to endure beyond their pilot phase, even if this were to be successful. Theirs and other research  call for a step change to replicate successful community-owned cases at a faster rate. This study illustrates a model that was successfully replicated across several cases in just over 5 years. The model was able to overcome challenges highlighted by scholars related to assembling technical, human, and financial resources [27, 37] as well as those of establishing appropriate local management for community-owned systems, the strategies for which have been discussed in the previous section. The study also shows the ability of the model to produce consistent social impact across several installations. As in other energy access studies [16, 38–40], positive social impacts are observed in the areas of education, health, safety, connection with the outside world, and increased time availability for women. While this study substantiates evidence of energy access providing improvements in women well-being , as highlighted by other studies , it also showed that these rarely translate in higher independence. Particularly for community-owned systems, this calls for further investigation regarding strategies to meaningfully integrate women in the processes for energy supply to achieve greater impact in terms of gender equity. Contrary to expectations from a participatory model, the study also found limited community-led initiatives, which is worth further investigation. Moreover, despite evidence over the replicability of the community-owned model, the study highlights untapped potential in the form of limited energy consumption and engagement in business activities. The high levels of affordability and high collection rates from the majority of sites seem to contradict the idea that the cause for low utilization is the limited paying capacity of the users [25–27]. Particularly, qualitative narratives collected in this study offer alternative contextual explanations for this phenomenon. The mindset of living within one’s means, a characteristic of many tribal communities visited in this study, results in a perception that electricity should be preserved for basic lighting. In addition, physical isolation, limited market links, and small customer base also constrain the potential and viability of local businesses [37, 40] to those linked with agricultural activities and small shops serving local customers. Low levels of energy use suggest that access to reliable and affordable energy alone does not ensure that the consumers will climb up the energy ladder. Instead, interventions that engage with the cultural mindset as well as address market linkages can produce greater economic impact than currently observed. Regarding environmental benefits, despite a considerable reduction in kerosene use, indoor environments continue to be unhealthy due to persistent use of wood as primary energy source for cooking. This suggests that, if energy access is to create healthier environments for people to live in, electricity interventions should go together with those tackling clean cooking. This study is the first of its kind collecting mixed data from a large number of community-owned SMGs that have been operational for many years and in different geographies. The study makes several contributions which are useful for practitioners, policy-makers, and researchers, offering guidance for the design of interventions that are scalable as well as suggesting methodological approaches for their operational evaluation. First, by substantiating a rigorous scoring approach with qualitative description of actors’ motivations and experiences, the framework provides thick explanation of patterns emerging across measures, bringing to fore narratives that would have otherwise been overlooked using a purely quantitative evaluation. Importantly, qualitative data provided an alternative explanation for the limited energy consumption and engagement in livelihood activities that are not linked to limited paying capacity of the users but rather to more contextual realities relating to the experiences of those living in remote areas. Qualitative narratives also revealed temporal patterns relating to building institutional sustainability and effectiveness of governance. This suggests that shortcomings of purely quantitative or qualitative ex-post sustainability assessments can be overcome by utilizing mixed methods to arrive at conclusions that are contextually relevant and provide more nuanced explanations of the phenomena. Second, the study provides mechanisms by which strong community-ownership for long-lasting SMGs can be created. The research suggests that allowing communities to directly influence decisions from the very early stages and set their own agenda, enables them to craft rules that are more in line with their means and needs, including overcoming perceived financial capacity constraints. Engagement with the local community results in higher social acceptance where their views, interests, and needs are reflected through co-creation of projects, be it setting the tariff, identifying the land for the infrastructure and participation in construction, or selecting members and organizing the VEC matters. Enabling active participation of women also increases rigor in the governance processes and achieve equity. Community-ownership created in this manner is sensitive to the specific socio-cultural contexts, leading to systems that are responsive to upcoming challenges and therefore more resilient. However, building strong ownership takes time to establish; calling for engagement that begins early on and continues well after the installation is completed. The limited ability or willingness of many stakeholders to provide continued and tailored assistance may be an underlying reason as to why many community-owned interventions implemented in a “one-size-fits-all” manner have failed in the past. Third, while prior research shows cases of successful community-owned energy access solutions, these are limited to pilot projects and lack evidence of replicable lasting models. This study shows an example of a community-ownership model that has been replicated successfully over many cases, consistently producing positive social impact. It was found that if on the one hand sensitivities to socio-cultural contexts are crucial to create a model that is sustainable and replicable, these same cultural contexts can also act as a limiting factor for expanding energy use and producing greater economic impact. Since increasing energy demand remains a challenge, tools that offer real-time traffic light signals about the resource position can heighten awareness of the excess capacity and promote greater utilization of energy for economic activities. These discussions also suggest that to produce greater socio-economic impact, rural development agenda must go beyond the mandate of energy interventions carried out by social entrepreneurs. A collaborative approach is necessary where government agencies, NGOs, social enterprises, and the private sector work together to create the necessary nexus between energy, agriculture, water supply, health, and communication to create an environment for smart sustainable rural living. The findings, like any other research, come with limitations. This study was cross-sectional, and it is recognized that longitudinal studies are best suited to study temporal variations. However, the cases studied share commonalities including their remote nature, relatively small-sized villages, often composed of tribal population, similar economic status, dependence on agriculture, and seasonal migration of residents for economic activities. This motivated the researchers to explore the time dimension of sustainability by comparing installations that were younger with those that were in operation for several years. Our findings provide preliminary insights into the temporal aspects of sustainability of community-owned models, particularly as regards the process of building institutional capacity, and provide the basis for further investigations. Khunti and Gumla districts in Jharkhand (green), Palghar (yellow), Amaravati (red), and Pune (blue) (these are districts in Maharashtra), Uttar Kannada in Karnataka (purple). Size of the circles is representative of the number of HH connected to the grids in each village. Calculation for utilization factor is based on an average India yield for solar panels of 1000 kWh/kWp per year, assuming 25% losses at maximum power output. SHG is a development sector initiative comprised of 10–20 individuals (generally women) supporting each other, usually through monthly financial contributions that can be used to assist members at time of needs. For this work, we are sincerely thankful to Anshuman Lath, Sameer Nair, Prasad Kulkarni and Anand Kawade, Directors at Gram Oorja Solutions for all the help and allowing access to their project sites. Thanks also to all numerous staff members at Gram Oorja for their ongoing assistance in coordinating and organizing field visits for data collection. We also thank Dr. Vivek Kumar from IIT Delhi, Centre for Rural Studies, local partner NGOs operating in the villages, and all independent field staff who helped in various phases of data collection. Finally, we wish to thank Aai Communications who helped with the translations of the surveys to local language. This research was partially funded by start-up funds provided to the corresponding author by the University of Minnesota Duluth. These funds were used to support data collection by independent field staff, their travel and lodging, and for translations of surveys and completed forms to and from the local language using an independent professional agency. Data can be shared on request. All requests can be sent to the corresponding author. All authors have collaboratively contributed to all phases of the research and in the development of the manuscript. All authors read and approved the final manuscript. The research team assessed the ethical issues involved in the work during the research design phase and found it to be limited due to the following reasons. First, the data (surveys and open-ended semi-structured interviews with VECs) were designed to be anonymous and did not need any personally identifying information. Second, an informed consent drafted in the local language, was shared with each participant which among other points clarified that their participation was voluntary and that they have the opportunity to opt out at any time with no consequences if they so desired. Third, there were no direct benefits of participation to either the individuals, the VEC or other participating organizations. Finally, all information was designed to be stored securely only with the researchers. Field staff were trained to work under the supervision of the researchers. Based on this evaluation, no major ethical concerns emerged and accordingly, no formal approval from the research committees was sought. To begin with tell us a bit about the village energy committee (VEC) – when was it formed, how was it formed, any document which describes the VEC and its functioning, how many members does it have, number of women on the VEC, when and how do the members of the VC change, what is the purpose of the VEC? Explain the hierarchy, if any as regards the structure and functioning of the VEC. How often do you interact with other agencies like the NGO or Gram Oorja for guidance? How are the members of the VEC elected? When was the last change to the committee members made? How are new members to the committee elected? Describe the process. How often does the committee meet? Describe a typical meeting - how is it called, who sets the agenda, how does follow up happen? How do you maintain records of the meeting? Tell us about an incident that was escalated to the VEC? What was it, why was it escalated, how did the VEC resolve it, who was involved in the decision process then? Who makes the final call in case of disputes? Likewise, tell us about a more memorable incident. Describe a situation when the VEC was working at its best/worst? Why did that happen? Is there anything you would like to share that we have not addressed? Cust J, Singh A, Neuhoff K (2007) Rural electrification in India: economic and institutional aspects of renewables. University of Cambridge. https://papers.ssrn.com/sol3/papers.cfm?abstract_id=2760810.